Our Cottage Collection takes indoor-outdoor area rug design to new heights of fashion and style. No longer mere, "high-traffic" floor coverings, Cottage rugs blend country-classic motifs and a sensible colour palette in incredibly functional and utterly attractive indoor-outdoor carpets. Power loomed using high-quality, durable synthetic fibres, Cottage Collection carpets accentuate and enliven the decor of any high-use area of the home or office. The home designer's first choice in easy-care, weather-resistant area rugs. 8 ft. X 11 ft. 2 in. Coordinate indoor and outdoor living spaces with fashion-right Amherst all-weather rugs by Safavieh. Power loomed of long-wearing polypropylene, beautiful cut pile Amherst rugs are made to stand up to tough outdoor conditions, but designed with the aesthetics of indoor rugs. Use these family-friendly geometric designs on patios, in kitchens, busy family rooms and other high traffic rooms. This is a great addition to your home whether in the country side or busy city. Our Cottage Collection takes indoor-outdoor area rug design to new heights of fashion and style. No longer mere, "high-traffic" floor coverings, Cottage rugs blend country-classic motifs and a sensible color palette in incredibly functional and utterly attractive indoor-outdoor carpets. Power loomed using high-quality, durable synthetic fibers, Cottage Collection carpets accentuate and enliven the decor of any high-use area of the home or office. The home designer's first choice in easy-care, weather-resistant area rugs. Cottage Norton Dark Grey / Light Grey 8 ft. x 11 ft. 2 inch Indoor/Outdoor Area Rug Our Cottage Collection takes indoor-outdoor area rug design to new heights of fashion and style. No longer mere, "high-traffic" floor coverings, Cottage rugs blend country-classic motifs and a sensible colour palette in incredibly functional and utterly attractive indoor-outdoor carpets. Power loomed using high-quality, durable synthetic fibres, Cottage Collection carpets accentuate and enliven the decor of any high-use area of the home or office. 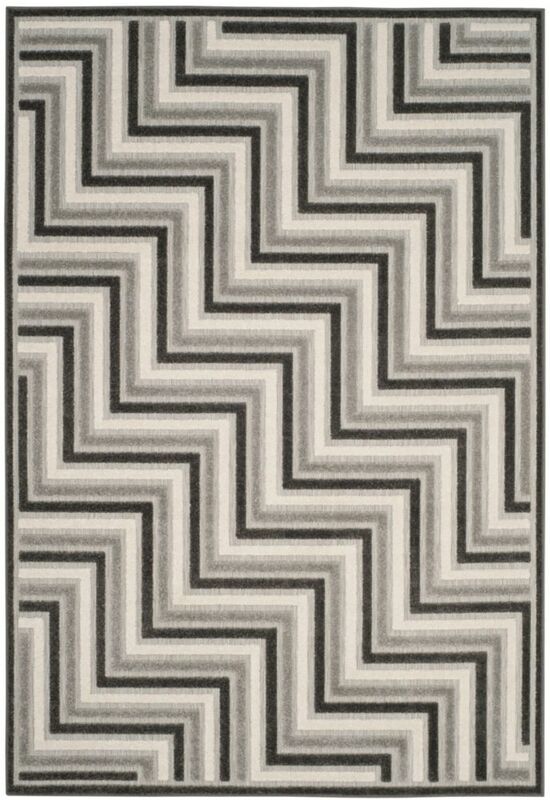 The home designer's first choice in easy-care, weather-resistant area rugs.